The global economy faces many difficulties, both short term and long term. In the short term, the global economy risks a prolonged period of sluggish growth, which will lead to problems such as high unemployment, debt default and low investment. In the longer term, the global economy faces greater threats from the environment, demographic changes and problems of resource scarcity. Japan was the first major economy to face a prolonged period of deflation – it led to a period of sluggish growth, recession and growing government debt as a % of GDP. 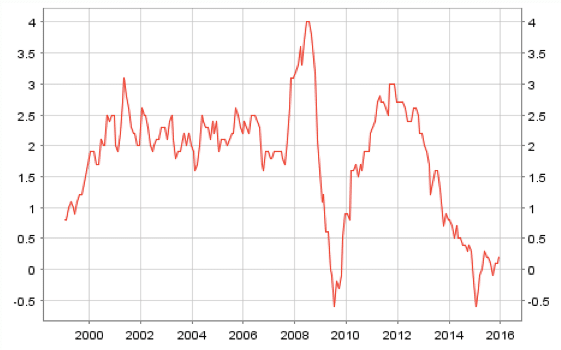 The Eurozone is now facing a similar period of deflation, and there seems no end in sight. 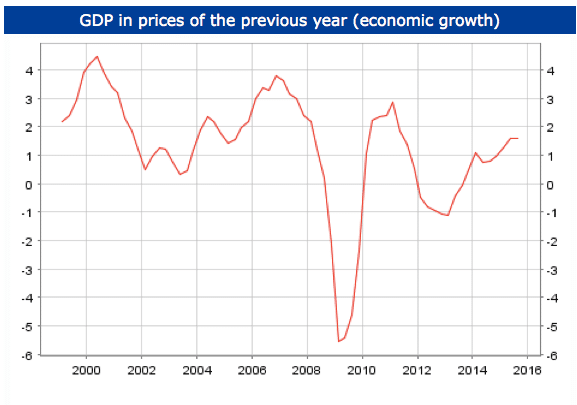 Deflation in the Eurozone is being caused by low growth, fiscal tightening, an attempt to reduce wages in order to increase competitiveness and falling commodity prices. The problem of deflation is that it can dissuade consumer spending as they wait for prices to be cheaper. Also, with deflation, we see a rise in the real debt burden; this can bankruptcy and discourage people from spending and firms investing. (see more problems of deflation) Deflation is likely to be more serious in the Eurozone than Japan.This is because Europe is caught in a cycle of deflation, growing real debt and austerity. Growing real debt increases pressure on governments to pursue austerity. But, more austerity tends to further create deflationary pressures, and the cycle of rising real debt burden continues. It is not all doom and gloom in Europe, there is a recovery of sorts, but actual growth has still fallen behind more optimistic targets. The cause of the last great recession was a banking crisis and subsequent credit crunch. There are fears that plummeting commodity prices and low growth, could cause renewed financial stress and bank losses. Usually a fall in oil prices would help the global economy – through helping to increase disposable incomes. But, the recent fall in oil prices has been so severe and sharp that major banks are losing money from investment in oil companies. It is not as severe as the sub-prime mortgage crisis, but a combination of other factors could cause banks to cut back on lending, leading to another period of tight credit and low investment. The financial fears of deflation, falling oil prices and lower confidence is reflected in global stock markets which have been volatile and falling since the start of the year. On its own, a fall in share prices doesn’t necessarily cause problems in the real economy. But, it is another factor that hits confidence and encourages firms to hold back on investment. 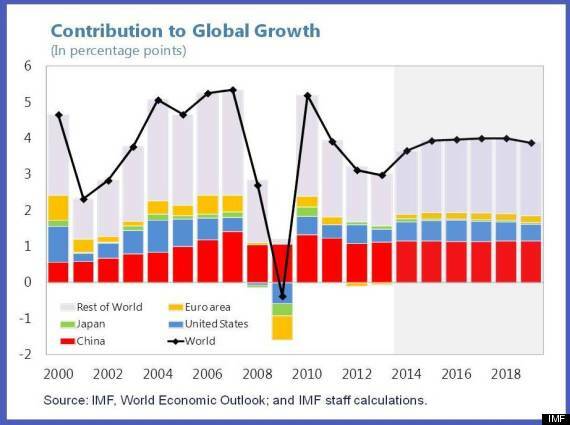 There was a time when the US economy was the bellwether for the global economy, but China is increasingly taking this role. In the past few decades, the rapid rate of Chinese economic growth has had knock on effects around the world – with strong demand for commodities and imports to feed the growing Chinese economy. However, as the Chinese economy slows down, we are likely to see further global deflationary pressures, as Chinese firms with excess stock cut prices. Also, a Chinese slowdown would affect many economies who have been exporting commodities and raw materials to China. Countries, such as Australia, Canada and African countries would be particularly affected. China’s economic growth of 6% a year may seem still very positive. But, just a few years ago, China was regularly recording 10% +. Secondly, there are fears China’s stats over-estimate the real situation. Thirdly, the real fear is that this slow down in the growth rate is just the start of a continued fall in Chinese economic growth. Finally, China has a lot of spare capacity, a fall in the growth rate could cause rising unemployment and loss of confidence. On the positive side, the US economy is doing relatively well. There is a reasonable recovery and US consumers have a significant impact on global demand, but the US recovery is not enough to carry the global economy – especially with growth in Europe still sluggish. A consequence of the dramatic fall in oil prices is that many oil producers are seeing a collapse in export revenues and tax revenues. Countries across the world, such as Russia, Saudi Arabia, and Venezuela are having to pursue austerity measures in response to falling oil prices. This is a negative impact on the world economy. Although they are not major economies, it is another cumulative negative influence on global investment and growth. Despite high rates of unemployment (over 10% in most European countries, with youth unemployment of 40%) the ECB has a reluctance to engage in unconventional monetary policy (such as helicopter drop). Germany economic policy is very conservative with a continued stress on austerity and not risking any possible inflation. It means there is a certain sclerosis around Europe’s situation. There is also a lack of political will to deal with the problem, unless there is a major crisis. Gaining consensus through Europe means there is a tendency to continue with existing policies, and not undertake more drastic measure to tackle deflation. This feeds through into expectations of both low inflation and low economic growth. The global economy does not look as weak as during the great recession. But, there is a feeling of standing on a precipice, with the scope for a renewed crisis and recession. In addition to the economic problems mentioned, there are also concerns over situations like the migrant crisis and environmental uncertainty further reducing confidence and investment. The problem is that after several years of recession and low growth, there are less reserves for dealing with another crisis. The global economy, and Europe especially could really benefit from a return to normal growth. This entry was posted in economics and tagged global economy. Bookmark the permalink. I have a question regarding the petero-dollariztion in which you cannot buy oil or sell it except in dollars. during this time and the price of oil reach about 30$ why we cannot see a decrease in the value of the dollar since the demand for dollar fall due to low oil prices ? What will happen to the dollar when the (Peterodollariztion) collapse is the dollar going to collapse too? Why should many oil producing countries trade only with dollar?